Lakeland, Florida — The Florida National University baseball lost both games of a doubleheader to Southeastern University Tuesday afternoon at Ted A. Broer Stadium, home of the Southeastern Fires. Florida National snapped SEU’s 15-game win streak with a victory just seven days ago. The 9-20 Conquistadors have notched wins over two Sun Conference teams, beating Florida Memorial 12-0 earlier this season. 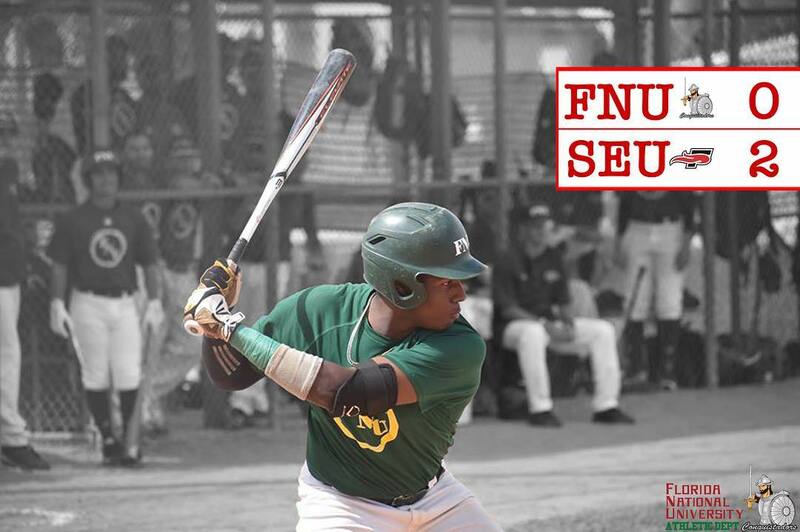 David Sarmento leads FNU with 20 hits. The center fielder has reached base safely in the last 13 competitions while registering a team-high eight doubles and a .345 batting average. The Fire and the Conquistadors split their doubleheader meeting last week. FNU collected a 7-4 win in the opening contest before Southeastern responded with a 23-1 victory in game two. Southeastern has won each of its last four games, outscoring opponents 50-7 during the span. The Fire leads the country in seven offensive categories including hits per game (12.1), home runs per game (1.8) and runs per game (10.6). Since starting the season 2-2, SEU has recorded at least 10 runs in 21 competitions, averaging 11.3 runs per contest on 12.5 hits per competition. Dominic Anagnos, who leads the team in both batting average (.436) and walks (27), has reached base in every game this season. The senior ranks 22nd in the nation in hits with 51 and have scored 40 runs, which ranks him 23rd in the NAIA. Records: FNU falls to 8-21 overall; SU improves to 35-4 overall. Records: SU improves to 36-4 overall; FNU slides to 8-22 overall. Manuel Mesa 1-for-2, two runs, 1 walk. Dominic Anagnos 1-for-3, one RBI. Josh Nelson: 2-for-4, one run, 4 RBI’s. Abdel Guadalupe: 12for-3, one RBI. 3 runs, 2 RBI’s and 2 walks. Ivan Nunez: 1-for-2, two RBI’s, 1 run, 1 walk. Nick Ferngren (W 2-0): 3.0 innings pitched, 6 strikeouts, 0 earned runs. A. Ruche: 1-for-2, one run. J. Carrero: 0-for-1, two walks. J. Zamora (L, 1-4: 1.1 innings pitched, seven earned runs, one strikeout. The Conquistadors will face #24 Keiser University on Friday, April 5th at 5:00 pm, at West Palm Beach, Florida.